Revolution: a Source of Insecurity and a Thing of the Past? Photo: Jesús Villaseca Pérez. Creative Commons BY-NC-SA (cropped). It’s safe to say that revolutions have always been sources, simple or otherwise, of insecurity and disorder in the short run. Indeed, elites and their minions invoke “revolution” to signify the disruption and chaos (with a soupçon of dread) that people’s efforts to fundamentally change aspects of the material and ideological conditions of their daily lives will bring. Yet for millions there is an almost romantic aspect, evoking not the convulsion attending any social change but boundless possibilities; herein lies the power of revolutions. So the question is really one of “insecurity and disorder” for whom? Insecure lies the heads of those who benefit from the status quo and their concern about disorder grows when revolution is in the air. Meanwhile, those who suffer from the conditions extant, their daily lives marked by the insecurity and disorder associated with globalization might reasonably think a bit more insecurity and disorder in pursuit of improving their lot may not seem like such a bad deal. A few caveats are in order. Perhaps more than ever before, we recognize that past, present, and future co-exist in complicated ways. As per the novelist William Faulkner, “the past is never dead. It’s not even past.” There is also “simply” nothing “simple” about revolution, insecurity, or disorder, a dynamic hinted at below. Finally, the underlying terms, security and order, strike me as illusory at best, since any person or society can be only one incident away from “insecurity and disorder,” which in any case might be in the eye of the beholder. So what, exactly, is a ‘revolution’? Defining revolution may seem a fool’s errand, but it is not unimportant. If Duc de la Rochefoucauld’s pithy parsing for King Louis XVI that the fall of the Bastille was no mere “révolte” but “une revolution” reminds us that we know it when we see it, today’s dominant formulation hews closely to Theda Skocpol’s, where state power is sought in pursuit of fast, fundamental transformations of state and class structures to alter societal systems in a contemporaneous and mutually reinforcing fashion. Jack Goldstone marries her structuralist approach to the efforts of John Foran and others of us to bring in subjective facets such as culture and ideology. If in some cases power may be captured non-violently (Tunisia) and/or electorally (Latin America’s Pink Tide), his conception of revolution as the forcible seizure of state power through mass mobilization in the name of social justice and seeking to transform or create new institutions and structures seems well suited to the moment. Revolutions are, as a rule, rare and momentous processes. People have been and are hungry, poor and watched their children suffer and die in many places at many times and not often risen up. Land, goods, and services have been and are unfairly distributed to the wealthy and powerful without prompting radical struggles. Thus, revolutionary imaginations and sentiments abound at any time, revolutionary situations less commonly, and actual revolutions rarely. And yet the people’s notion of revolution as rapid, dramatic social upheaval meant to produce striking, broad, and meaningful change persists. Regardless of what governments, media, or academics say, this notion of revolution in the streets or squares or on social media and in the ‘twitterverse’ is driven by the dynamic of hope and reflects the desire of many people in many places at many times to enable and more importantly ennoble their struggle(s) by setting them in a revolutionary tradition. We should be wary of denying people’s lived experiences and their sense(s) of meaning with which they imbue their lives, their actions, their world(s). More and more people are stepping out of their homes to claim their private hopes and dreams in public fora. If this is not revolution in the grand scale we conventionally associate with the term, is it revolutionary nonetheless? Some of us argue that there have occasionally been global waves of revolution, as in 1848 and 1968 (and perhaps 1917–18), and it is too soon to tell whether today’s are another. But resistance, rebellion, and revolution seem to be in the air, a perception heightened by social media. A few years ago politicians, pundits, and academics of various perspectives assured us that the “age of revolution” (1789–1989), was over. A time, place and space had passed, none too soon and not to be missed. Reports quickly proved exaggerated, as Eastern Europe’s “refolutions,” the “Pink Tide” in Latin America, and persistent revolutionary struggles elsewhere made clear. And at least since 2009 in Iran (but also in Georgia, Guinea, Iceland, Moldova, and elsewhere), there has been a steady rise across the globe of people pressing for social and political and economic change, seeking control over the material and ideological conditions of their everyday lives. 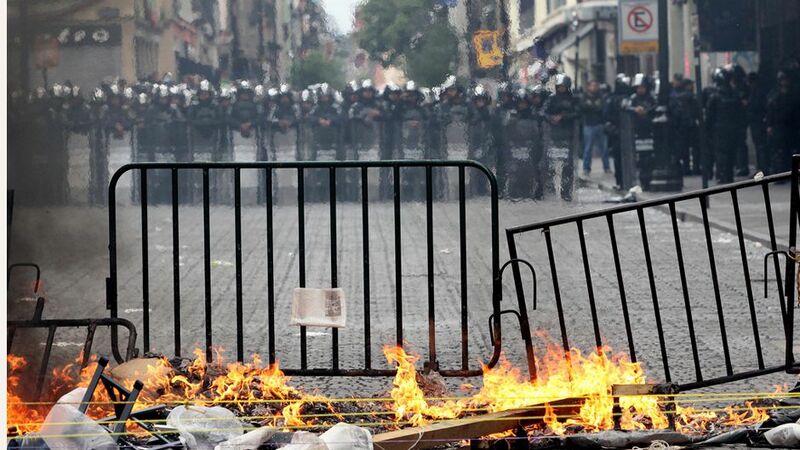 The uprisings in the Arab world, various indignant movements throughout Europe, Chile, and Mexico, the North American Occupy movement, Brazil, Gezi Park in Turkey, Ukraine, and India’s Naxalites all remind us that radical socio-political movements for greater participation and social equality persist. Whatever their demands — or no demands — such collective behaviour represents a call to be seen and heard, reflecting Martin Luther King, Jr.’s “fierce urgency of now” and the compelling question posed by Mexico’s Zapatistas: “is this the democracy you wanted?” More and more people are stepping out of their homes to claim their private hopes and dreams in public fora. If this is not revolution in the grand scale we conventionally associate with the term, is it revolutionary nonetheless? Who among us is prepared to tell people their struggles for justice and dignity are “simply” “disorder”? As people move from revolutionary imaginations to share their revolutionary sentiments and seek to create revolutionary situations, they rely on stories to do so. Messy, open-ended, and complicated, these stories tell us much about who and what we were, are, where we want to go and who we want to be. Such stories shift and change in ways that are hard to predict and harder still to pin down, versions and variations often transient and effervescent. This no doubt contributes to a vague sense of unease, and concerns about insecurity and disorder. Yet it is in insecurity and disorder that hopes, dreams, desires, and, hence, possibilities exist. When states are weak and elites withdraw and groups begin to challenge, mobilization can occur and states — and others — will respond. How this process unfolds in any given time or place and whether it succeeds fundamentally depends on the myriad particulars at play in each country. Walter Benjamin, writing at an ominous juncture in the late 1930s, argued that the “state of emergency” in which they were living was the rule, not the exception, and that people needed to create their own states of emergency to bring about change. While most of us do not live in states constricted and constrained by explicit “states of emergency,” such threats are never far away. Indeed, most of us find ourselves in a time and in places of essentially permanent “states of emergency,” one event or threat, real or perceived, away. Thus are forms of security and order imposed on us, often used by those who seek to maintain their power at the expense of the disenfranchised to proscribe and stifle people’s efforts to bring about meaningful change in their state or society. Revolutions are rare both because states are strong and those who benefit defend the social order. But when states are weak and elites withdraw and groups begin to challenge, mobilization can occur and states — and others — will respond. How this process unfolds in any given time or place and whether it succeeds fundamentally depends on the myriad particulars at play in each country. And so to the crux of the question. Once upon a time, revolutions were inscribed as rare and momentous occasions, designating great and grand efforts to fundamentally transform humanity with an eye to the worth and dignity of every human being. Today’s movements, in contrast, seem to many as little more than rock throwing or a groupuscule able to muster a protest. Even when they are larger, such movements often seem focused on specific grievances with essentially reformist demands — hardly reminiscent of the sweeping, world-altering dimensions of revolutions past, nostalgically remembered as seeking to change a given society as a mere way station on the way to changing the entire world. Yet what could be more meaningful than changing the small worlds that are our everyday worlds and hence matter most for most of us most of the time? If insecurity and disorder are attendant to such efforts, it is because for those engaged in such struggles the material and ideological conditions of their everyday lives evince neither security nor order or do so at the expense of their dreams and desires. In which case, the question shifts from what constitutes order and whose security is at risk to whether in disorder there may be great opportunity for reimagining, reworking, and reshaping one’s life. Revolutions are fundamentally struggles to rectify injustice; as long as unjust social orders exist, revolutions will be a recurrent aspect of politics and society, regardless of the banner people choose to fight under. Revolution: a Source of Insecurity and a Thing of the Past? by Eric Selbin is licensed under a Creative Commons Attribution-NonCommercial-NoDerivatives 4.0 International License. Permissions beyond the scope of this license may be available at International Relations and Security Network (ISN). Eric Selbin is Professor of Political Science and University Scholar at Southwestern University. His research interests are in the areas of resistance, rebellion, and revolution, theories of revolution, and socio-political change.